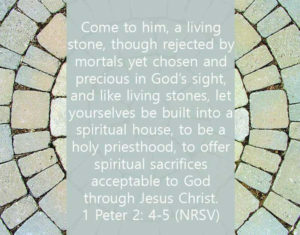 Living stone, it is a strange little metaphor we encounter in 1 Peter. What could that mean? A stone is inanimate, it has no breath or heart and yet Peter uses this to describe our Lord and challenges us to become the same. It seems what Peter is offering to us is Christ as the foundation of the kingdom of God and our own lives. But Christ is not simply a static foundation stone, laid at the corner and forgotten. No! Christ is alive, life-giving, and always at work in the world. Christ is building the church, living stone by living stone until he returns. We are the living stones Jesus uses to build the kingdom of God on Earth; each of us playing an integral part in his great mission. To participate we must be refined, our jagged edges cut straight and our hearts polished to perfection. This is discipleship; the process of spending time with Jesus as he lovingly carves and polishes us into the perfectly shaped living stones he is laying for his future kingdom. Sign up for a monthly email filled with devotions, tips, resources, and more! View the Latest Living Stones Email!